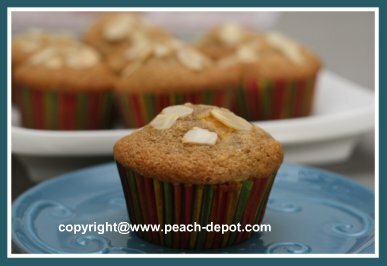 This Peach Almond Muffins Recipe blends the great flavours of almonds and peaches to create a truly scrumptious fruit and nut muffin. 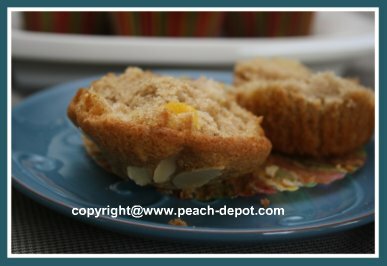 These healthy muffins are quick and easy to make ... and you can make them using fresh OR canned peaches. I like to make a double batch so we can eat some hot from the oven, and freeze some for later. They make are a great school or work lunch bag snack idea! If desired, you can vary the recipe ingredients by adding a handful of blueberries. Also, you may want to use all whole-wheat flour instead of the all-purpose flour. Let's get making homemade muffins! Wondering what to do with left-over peach juice? **Note - You can use canned peaches (about 16 oz. can) instead of fresh peaches. In a large bowl, combine the flours, sugar, salt and baking soda. In another bowl, using a fork, beat the eggs, and mix in the oil, vanilla extract, almond extract and the milk. Gently stir the egg mixture into the dry ingredients, just until combined. Gently fold in the chopped peaches and the chopped almonds. 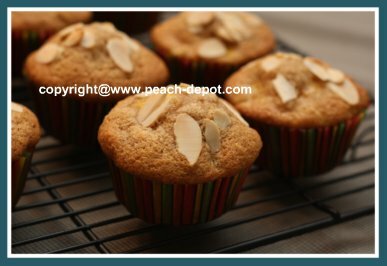 Fill greased or paper-lined muffin cups 3/4 full, and sprinkle muffin tops with chopped or sliced almonds for garnishing. Bake at 375° F for about 20 - 22 minutes, or until a toothpick inserted in the center comes out clean. Enjoy these muffins warm, or cool. You can wrap the muffins individually, and freeze them for up a couple of weeks, and remove them when you are looking for a healthy snack! 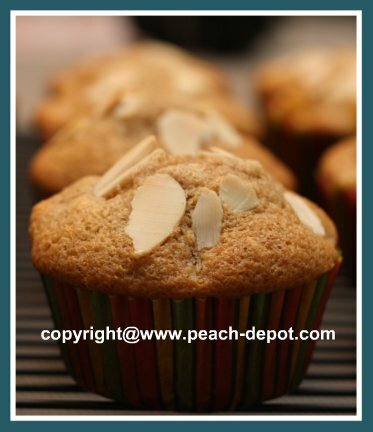 Use Fresh or Canned Peaches to Make Yummy Muffins!